I’ve written about a few of my recent projects (404 Film, Nosh Promo, Firespotter Logo). These were all completed for Firespotter Labs, which is the startup I cofounded earlier this year. We started out with four of us and we are now thirteen, primarily engineers. Up until now, I’ve been the only designer. We are growing fast and the design needs of our company are such that one visually-minded pixel crusher is no longer enough. We are looking for another full-time interface designer. Firespotter Labs is a startup. We are looking for someone that enjoys this kind of atmosphere. I’ve written a little bit about what it’s like and I couldn’t endorse it any more positively. Our first app launched about one month ago, so we are primarily working on it, but we have a couple other products in development that will need a lot of love. 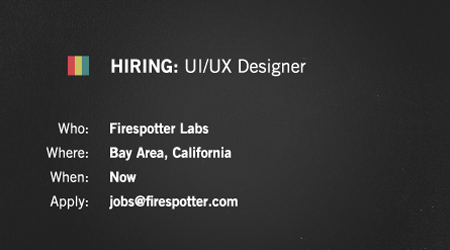 If you’re interested, please email me at jobs[at]firespotter.com and use the subject line “Design Position”. We are looking for someone with a strong skillset in user interface design. Usability is key. If you can make things that look awesome as well, rock and roll. 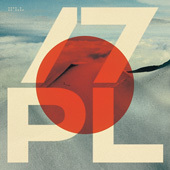 Please include a link to your portfolio and/or Dribbble. If you’ve worked on sites or apps in the past, it would be very helpful if you could link these as well. We are hoping to fill this position as soon as possible. I’m totally useless sorry. I’ve been blown away by everything you all have accomplished at Firespotter Labs, if you ever need pro bono sound design or music I would absolutely love to help out. @Porto Novo- Right on! Yeah we actually probably will need some sound/music work at some point. I have really enjoyed making our promo videos and it would be great to have some customized sounds going on for subsequent. I’ll hit you up next time we’re in need. Not my bag of tricks, but it sounds like a sweet position. If you ever need an industrial designer, I’ll be the first to apply. I love the startup culture and it looks like you’ve got a great group there. Best of luck. Stay awesome. I wish I could fill in that position. I wish that I lived in that area. I currently reside in North Carolina. I’ve kept up with progress of Firespotters Labs. I wish you the best in finding someone to fill the position. I enjoy exploring different realms of design. I have knowledge of server-side and client-side web development languages. I’ve designed for both the web and print. I spent three years while in college, working part time in the media services department (the TV studio) on campus. I have an appreciation for UI/UX, and keep the user at mind while designing for the web. Once again best of wishes finding someone on the west coast who meets your requirements. Wow, this sounds like a fantastic opportunity. I’m sure whoever fills this position will be extremely happy. I’d apply, but moving from Chicago to Cali might be too much of a stretch. I’ll be sure to keep up with Firespotter and watch you all evolve! Very interesting post. I like to share this post with my friends and book mark this interesting page.